Risks Hip replacements improve the quality of life for many but come with risks. Surgery Complications from hip replacement surgery can cause debilitating physical conditions. Benefits Patients should learn about risks and benefits from hip replacements. A hip replacement — also called hip arthroplasty — is surgery to repair a diseased or injured hip joint by replacing it with an artificial joint or implant. People usually receive these surgeries because osteoarthritis causes hip pain and inflammation. Hip fracture and natural wear-and-tear are also common reasons for hip replacement surgery. Hip replacements help millions of people regain mobility and find relief from joint pain, but hip replacement surgery is accompanied by some risk and requires months of recovery. Prospective patients should know that implants don’t last forever, and some hip implants have a better safety record than others. They should take steps to be sure a hip replacement is right for them and that the device they’re receiving has a history of success. Dr. Marius Smith-Petersen made the first arthroplasty mold in 1925. He went on to create the first total hip replacement with stainless steel. Since then, hip replacements have become somewhat common. An estimated 4.7 million Americans are currently living with hip replacements, according to a 2015 study published in The Journal of Bone and Joint Surgery. 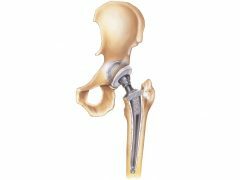 There are three basic components of an artificial hip: a stem that is inserted into the femur, a ball that attaches to the top of the femur and a cup that attaches to a socket in the pelvis. The ball, also called a femoral head component, replaces the head of the femur. The cup, also called the acetabular component, is implanted into the pelvis. Although hip replacement surgery is common, it is a major surgery that has a variety of risks. Doctors and patients should consider the benefits and risks of the operation before it’s performed. When a person walks or moves their legs, the femoral head moves within the acetabulum in a similar fashion to a ball-and-socket joint. Although hip replacement surgery is common, it is a major surgery that has a variety of risks. Complications during surgery or later in life can cause debilitating side effects. Thus, doctors and patients should consider the benefits and risks of the operation before it’s performed. The best candidates for hip replacement surgery include people who experience pain that disrupts regular activities. In addition to people with osteoarthritis or hip injuries, people with rheumatoid arthritis, osteonecrosis or bone tumors may need hip replacements to relieve pain. People also receive hip replacements to increase mobility and improve overall quality of life. Most doctors will ask patients to consider alternative methods for relieving pain or increasing mobility before deciding to have an artificial hip implanted. One such option, Subchondroplasty, attempts to promote natural bone growth to repair damaged hips. Doctors inject a bone substitute into the hip joint. The material fills gaps, voids and lesions in the bone. Over time, the body begins replacing the material with natural bone which can sometimes lead to permanent repairs. If alternative treatments do not provide relief, increase mobility or improve quality of life, doctors may consider a hip replacement procedure. They will analyze the patient’s medical history, take x-rays and perform physical exams to test hip mobility and strength. They may also conduct MRIs or CT scans. People between the ages of 50 and 80 are the most common candidates for hip replacements. However, some doctors believe more young people can receive hip replacements than in the past because of advances in technology. Many people experience pain relief and improvements in daily living after receiving a hip replacement, but the devices are not miracle cures. Hip replacement surgery has a number of risks, and the implants wear out over time. To avoid complications, people who receive implants should not jog, run or participate in high-impact sports. They may be able to swim, bike or perform other low-impact activities. Surgeons perform hip replacements with a posterior (back of the hip) approach or an anterior (front of the hip) approach. 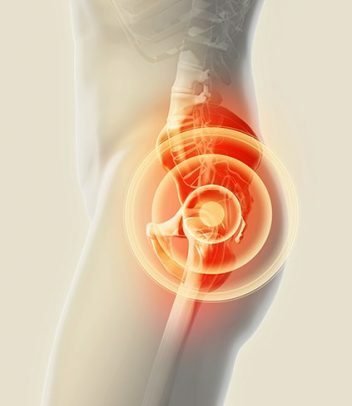 They often choose the posterior approach because it allows better visibility of the hip joint, and it is less invasive. Special bone cement is commonly used to hold hip implants in place, but some surgeons use a cementless fixation technique. Devices that do not require cement have a textured surface that allows the bone to grow onto the implant and secure it. A hybrid total hip replacement involves implanting the cup without cement and setting the stem in place with cement. A total hip replacement uses an artificial joint to replace the entire hip structure. During the procedure, surgeons insert the hip stem into the patient’s femur for stability, replace the head of the femur with a ball and replace the socket with an artificial cup. Total hip replacements are the most common type of hip replacement surgery. Doctors recommend partial hip replacements (hemiarthroplasty) when only one part of a hip needs treatment. In most cases, the acetabulum, also known as the socket or cup, remains intact and a ball replaces the head of the femur. Some partial hip replacements only address the acetabulum. A partial hip replacement typically corrects a hip fracture at the neck of the femur. A hip resurfacing procedure can delay a total hip replacement in younger patients who are likely to outlive the original implant and require a second surgery later in life. Doctors may also recommend hip resurfacing to improve symptoms of arthritis. During hip resurfacing, surgeons replace the socket with an artificial cup and resurface the head of the femur instead of removing it. Then they cement a cover that’s usually made of metal on top of the femur. The cover has a short stem that is inserted into the neck of the femur. Device manufacturers design hip implants to mimic the natural movement of the body. Implants are made from a combination of materials, including plastics, ceramics and metals. The primary differences between implants are their size and the material of the components. Hip implant components are made of polyethylene (plastic), metal, ceramic or a combination of the materials. Many new models were made from metal-on-metal components because manufacturers believed the metals were more durable than other materials. However, metal-on-metal devices have been linked to other complications and are rarely used. Are doctors still using metal-on-metal hip implants? Attorney Holly Ennis reveals whether doctors are still using metal-on-metal hip implants. The most common type of hip implant has been used since the 1960s. Plastic has a smooth surface that causes little friction while the ball moves within the socket. However, MoP implants produce a lot of plastic debris, which will eventually cause the implant to fail and could lead to a condition called osteolysis (loosening of the implant in the bone). MoM implants are very durable and can withstand the active lifestyle of younger patients. They have less wear and are compatible with larger bearings than implants made of other materials. However, their durability comes at a price. MoM hip implants can shed metal particles that may cause a number of serious health issues such as a type of metal poisoning called metallosis. MoM implants have been scrutinized because of design flaws and early failure rates. Several manufacturers, including DePuy and Stryker, have recalled one or more all-metal hip implants. Unlike the plastic used in the MoP device, the plastic used in CoP devices is dense. Although these materials are reliable and provide a smooth surface, there is still a risk of wear that causes debris that leads to osteolysis. All-ceramic hips are known for their durability and reliability. They have been around since the early 1980s, but the Food and Drug Administration only recently approved them for use in the United States. The femoral ball is made from hard clay that is wear-resistant, but the devices have a history of producing a squeaking noise and shattering. The first ceramic-on-metal hip received FDA approval in 2011. The manufacturers of the product hope that it doesn’t cause problems associated with metal-on-metal hip implants. They are currently conducting postmarket analyses of the implants. Hip replacement surgeries usually last between one and two hours. Surgeons create a six-inch incision on the side of the hip and remove damaged tissue, cartilage and bone from the hip. Then the components of the hip implant are inserted and cemented to healthy bone. If the surgeon is performing a procedure without cement, he or she fixates the components so bone will grow around them. Patients who are younger than 50, have a normal body mass index or who are in overall good health may be candidates for minimally-invasive surgery. During this surgery, the incision is smaller and recovery time after the surgery is shorter. There are several ways to prepare for hip replacement surgery. In addition to learning about the surgery, patients should ask for someone to help them during the first few weeks after they leave the hospital. If no one is available, a social worker or other form of assistance may be necessary. Patients should organize their home so they have a comfortable place to spend their time. Overweight patients should consider losing weight to decrease stress on the hip after surgery. Patients should also visit a dentist to ensure good oral health. Bacteria from gum disease or other dental problems can enter the blood and cause infection in the hip after surgery. Most people stay in the hospital for a couple of days after having a hip replacement. Some health providers put a pillow or other device between the legs of patients to protect the hip during the first day after surgery. They also provide pain relievers, such as opioids and NSAIDS, to relieve immediate pain after surgery. Some patients receive spirometers, a device that helps them take deep breaths, to prevent pneumonia caused by anesthesia. Basic physical therapy, such as walking with a walker, usually begins within one day of surgery. Patients also learn strengthening exercises before being discharged. After leaving the hospital, patients can begin performing light activity in the home to increase mobility. Most patients receive a walking program that gradually increases daily activity and a physical therapy routine composed of simple exercises. People who have hip surgery may have a weak appetite, but they should eat a balanced diet to improve tissue recovery. They should also take care of the incision point until stitches are removed. Recovery from hip surgery usually takes between three and six months. There are several steps patients can take to avoid common complications during this time. 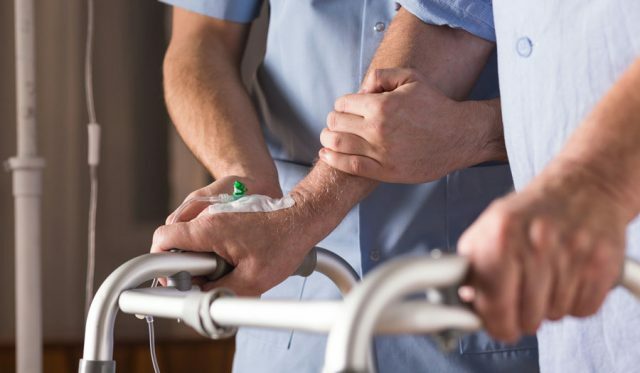 It is important to avoid falls and other injuries to the hip, so patients should use canes, crutches or walkers when necessary. They should also avoid stairs and other steep inclines during the first months after surgery. To avoid infection, patients should talk to their doctor about taking antibiotics before dental operations. They should also take medications as prescribed to avoid blood clots. Special attention should be paid to sitting, sleeping and bending to avoid dislocating the hip. Most people who have hip replacement surgery do not experience major complications. Dislocation is the most common complication, according to the National Institute of Arthritis and Musculoskeletal and Skin Disease. Less than two percent of patients experience complications, such as infection, according to the American Academy of Orthopedic Surgeons, and a 2014 review of research on hip replacements concluded that improved hospital procedures have resulted in a reduced mortality risk after surgery. Mortality during the 90-day period after surgery dropped from 0.56 percent in 2003 to 0.29 percent in 2011. Some complications only occur in certain types of implants. For example, metal-on-metal implants may cause metallosis, but ceramic and plastic implants without metal components do not cause that side effect. Most hip implants last for 10 to 15 years, but the devices wear out more quickly if the patient has an active lifestyle. Some implants wear out faster than others, requiring revision surgery to remove, repair or replace the device. 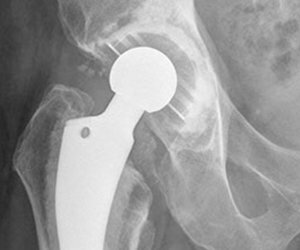 An estimated 10.4 percent of hip replacements require revision surgery, according to a 2016 study published in Arthroplasty Today. The FDA approves hip replacement systems before manufacturers can market them in the United States. But sometimes it approves new devices based on limited evidence and requires manufacturers to study how they affect people. A hip replacement recall usually happens when the device causes a large number of adverse events. Other hip implants were approved after clinical trials indicated that they were safe and effective, but the devices ended up causing large numbers of adverse events. The following hip implants have been the subject of adverse event reports made to the FDA by consumers and health care professionals. 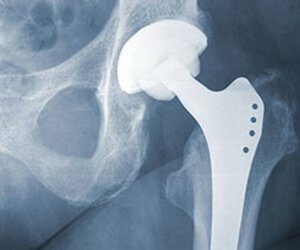 Some of the devices have been recalled and taken off the hip implant market, while others have only been affected by limited recalls caused by manufacturing or packaging errors. The FDA classifies metal-on-metal hip systems as Class III (higher risk) medical devices, but many of them have been cleared for marketing through the agency’s 510(k) premarket notification process. Under the process, companies need only show that their product is “substantially equivalent” to other devices already approved by the FDA before the company can start selling them. Since they have entered the market, metal-on-metal implants have had some of the highest failure rates among all types of hip implants. Studies show these hip implants produce metal ions that enter a recipient’s bloodstream causing metallosis. Other complications include loosening of the hip implant, joint dislocation and joint squeaking. Metal-on-metal implants have had some of the highest failure rates among all types of hip implants. Many people with these problematic artificial hips have opted for revision surgery to receive a new hip implant. Some patients filed lawsuits against hip implant manufacturers, claiming the companies knew their hip systems were defective. 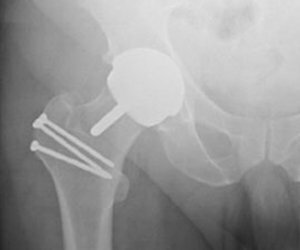 Metal-on-metal hip replacements have fallen from popularity because of the high rate of complications that they caused, but other hip implants have long histories of safety. Hip replacement procedures are considered major surgeries that have risks, but most people live improved lives after receiving hip replacements.